Brief – A professional background in logistics led the business owner to found a courier company, based on traditional values. Efficiency and personal service are not always to the fore in the courier industry. 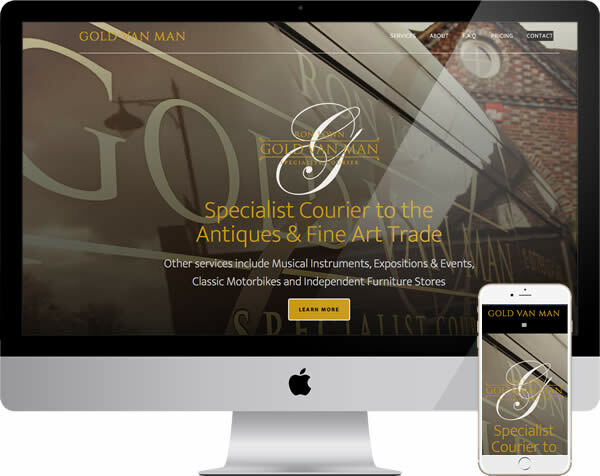 The new website would convey the difference Gold Van Man’s high quality support could make. Whilst the site would be used across a range of devices, the need for a courier can arise at any time. Quick access to information for people on the move would be valuable. Technical & Search – The intention was not to be a local courier company, or to rank on a national basis, or compete purely on price. Simply for the company to be easy to find. Our client intended to build business through personal contact and word of mouth. Ensuring the business name returned well in search would meet the needs of anyone following up online. Even this is not guaranteed but not difficult and for some, a rational marketing decision. PJW are leaders in the field of search, yet agree that is not the best route for every business. Design & Build – The website was intended to be small, focused. A viable design would need to place key service information well and quickly get across the nature of the business. Chosen corporate colours of coffee, white and gold were ideal to create the correct feel. Mixing with a backdrop of antique furniture and images of the well maintained vehicles. The mobile view maintained this ethos and allowed customers to get a picture of all the services available. Along with contact details they would need. Outcome – Our client is moving forward by building relationships. An online presence showing a good quality business still matters, for direct contacts and those hearing of them. A well designed website does not always need to be a notable investment. Smaller, brochure style sites have a place, can reflect the business well and pay for themselves quickly. You are welcome to see other examples of websites of all sizes we have created, or our introduction to web design. By all means get in touch, if you would like to discuss your own web project.